Current sensing resistors are resistors used for measuring current in the circuit which can be converted using Ohm’s Law into a voltage reading. They usually come in very low resistance values, often measured in micro Ohms. At Rhopoint Components we offer a wide range of current sensing resistors by leading manufacturers including Isabellenhutte, Alpha, Caddock, Riedon and Susumu. Our current sensing resistors come in various shapes and sizes, surface-mount and through-hole, and we can cater for virtually any resistance value. Can't find what you're looking for? Contact us, we can often offer customised solution to meet all your needs. The FNP high power precision shunt resistor series from Alpha Electronics offers a range of very high precision current sensing shunts with a maximum power rating of 500W on a suitable heat sink at +25°C. By utilising a Ni-Cr Bulk Metal® foil resistor technology, they are able to produce resistors with low temperature coefficients. The FNP shunt resistor series has a built in Pt100 sensor for monitoring the temperature of the resistive element. The PSB ultra-precision power shunt resistor series from Alpha Electronics offers 4-terminal (Kelvin) connections for current sensing and a power rating of up to 40W on a heat sink or 12W in free air (at +25°C) all with a low ohmic resistance range from 0.001Ω to 1Ω. By utilising Alpha's Bulk Metal® foil resistor technology, they are able to offer excellent temperature characteristics with low temperature coefficients down to ±5 ppm/°C between the resistance range 0.005Ω and 1Ω. The PSB ultra-precision shunt resistor series exhibits excellent temperature characteristics thanks to Alpha's Bulk Metal® foil resistor technology, making them suitable for the most demanding precision and high power applications. The 4-terminal connections of this high power shunt series offers accurate current sensing capabilities even in low extremity of resistance. Their 4-terminal design and high precision make them ideal for current sensing in precise power supply or motor driver applications. The RBD ultra-precision current sense resistor series from Alpha Electronics offers low resistances of between 0.01Ω and 1Ω all in a small 2-terminal flip-chip package. By utilising Alpha's Bulk Metal® foil resistor technology, they are able to offer low tolerances down to ±0.5% as well as a low TCR of ±10 ppm/°C (between -25°C and +125°C) both within the resistance range of 0.1Ω to 1Ω. The RBD ultra-precision current sense resistor series offer ultra-precision thanks to Alpha's Bulk Metal® foil resistor technology, making them suitable for the most demanding precision applications. 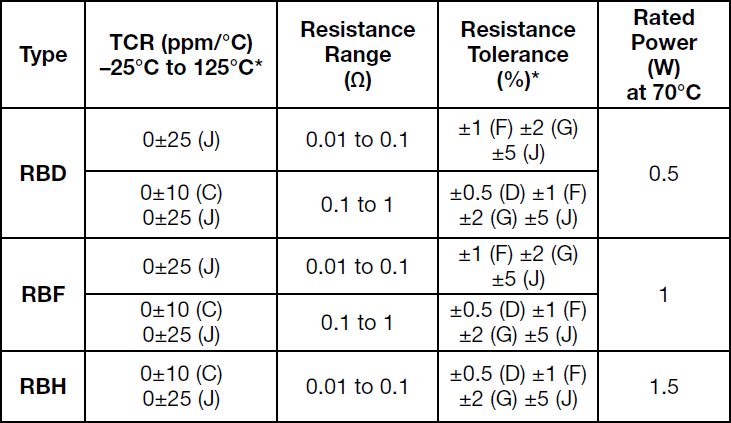 Temperature rise of resistor surface can be optimised by using a board made of metal. This keeps the temperature rise very low allowing increased power rating of the parts i.e. 2W at +70°C. Please keep the temperature of board less than +90°C when using glazed epoxy board. The RBF ultra-precision current sense resistor series from Alpha Electronics offers low resistances of between 0.01Ω and 1Ω all in a small 2-terminal flip-chip package. By utilising Alpha's Bulk Metal® foil resistor technology, they are able to offer low tolerances down to ±0.5% as well as a low TCR of ±10 ppm/°C (between -25°C and +125°C) both within the resistance range of 0.1Ω to 1Ω. The RBF ultra-precision current sense resistor series offer ultra-precision thanks to Alpha's Bulk Metal® foil resistor technology, making them suitable for the most demanding precision applications. 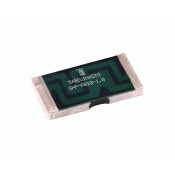 The RBH ultra-precision current sense resistor series from Alpha Electronics offers low resistances of between 0.01Ω and 1Ω all in a small 4-terminal (Kelvin connection) flip-chip package. By utilising Alpha's Bulk Metal® foil resistor technology, they are able to offer low tolerances down to ±0.5% as well as a low TCR of ±10 ppm/°C between -25°C and +125°C. The RBH ultra-precision current sense resistor series offer ultra-precision thanks to Alpha's Bulk Metal® foil resistor technology, making them suitable for the most demanding precision applications. The RWA precision wraparound SMD resistor series from Alpha Electronics offers resistances from 100Ω up to 5kΩ, all with a small 0603 chip size. By utilising Alpha's Bulk Metal® foil resistor technology, they are able to offer low tolerances down to ±0.05% (between 1kΩ and 5kΩ) as well as a low TCR of ±5 ppm/°C (between -25°C and +125°C) over the whole resistance range. The Alpha RWA series also offers excellent load-life stability of ±0.005% typical (+70°C, 2000 hours at rated power). The RWA high precision wraparound surface-mount resistor series offers high precision and excellent stability thanks to Alpha's Bulk Metal® foil resistor technology, making them suitable for the most demanding precision applications. The RWB precision wraparound SMD resistor series from Alpha Electronics offers resistances from 10Ω up to 10kΩ, all with a small 0805 chip size. By utilising Alpha's Bulk Metal® foil resistor technology, they are able to offer low tolerances down to ±0.02% (between 1kΩ and 10kΩ) as well as a low TCR of ±2 ppm/°C (between -25°C and +125°C) from 100Ω up to 10kΩ. The Alpha RWB series also offers excellent load-life stability of ±0.005% typical (+70°C, 2000 hours at rated power). The RWB high precision wraparound surface-mount resistor series offers high precision and excellent stability thanks to Alpha's Bulk Metal® foil resistor technology, making them suitable for the most demanding precision applications. The RWC precision wraparound SMD resistor series from Alpha Electronics offers resistances from 5Ω up to 30kΩ, all with a small 1206 chip size. By utilising Alpha's Bulk Metal® foil resistor technology, they are able to offer low tolerances down to ±0.01% (between 1kΩ and 30kΩ) as well as a low TCR of ±2 ppm/°C (between -25°C and +125°C) from 100Ω up to 30kΩ. The Alpha RWC series also offers excellent load-life stability of ±0.005% typical (+70°C, 2000 hours at rated power). The RWC high precision wraparound surface-mount resistor series offers high precision and excellent stability thanks to Alpha's Bulk Metal® foil resistor technology, making them suitable for the most demanding precision applications. The CC1512FC low resistance precision flip-chip surface-mount resistor series from Caddock offer resistance values from as low as 0.01Ω up to 10Ω making them ideal for current sensing applications. The CC1512FC series features low inductance of 5nH (typical) which provides excellent high frequency and pulse response, with high pulse handling and overload capabilities. 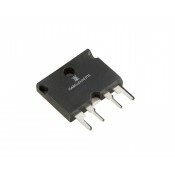 For general applications, the CC1512FC series has a power rating of 0.75W (at +70°C). The CC1512FC series from Caddock are the best choice for switching power supplies, motor speed controls and high current sensing applications. Thermal resistance is provided for the CC1512FC series to optimise high power designs when utilising higher thermal conductivity circuit board substrates such as IMS or Alumina. Please see datasheet for further details. The recommended solders for flip-chip solder attachment are Sn (62) / Pb (36) / Ag (2), Sn (96.5) / Ag (3.5), or standard Sn / Ag / Cu solder alloys. Please see datasheet for notes relating to the power capabilities. The CC2015FC low resistance precision flip-chip surface-mount resistor series from Caddock offers resistance values from as low as 0.02Ω up to 10Ω making it ideal for current sensing applications. The CC2015FC series features low inductance of 5nH (typical) which provides excellent high frequency and pulse response, with high pulse handling and overload capabilities. For general applications, the CC2015FC series has a power rating of 1W (at +70°C). The CC2015FC series from Caddock is the best choice for switching power supplies, motor speed controls and high current sensing applications. Thermal resistance is provided for the CC2015FC series to optimise high power designs when utilising higher thermal conductivity circuit board substrates such as IMS or Alumina. Please see datasheet for further details. The CC2015WB low resistance precision wire-bondable surface-mount resistor series from Caddock offers resistance values from as low as 0.02Ω up to 10Ω making it ideal for current sensing applications. The CC2015WB series features low inductance of 5nH (typical) which provides excellent high frequency and pulse response, with high pulse handling and overload capabilities. The WB variant of the CC series from Caddock is a hybrid mountable version with metallised pads for wire-bonding utilising aluminium wire and a metallised back surface for solder attachment of the back surface to a heat sinking substrate. The CC2015WB series from Caddock is the best choice for switching power supplies, motor speed controls and high current sensing applications. Thermal resistance is provided for the CC2015WB series to optimise high power designs when utilising higher thermal conductivity circuit board substrates such as IMS or Alumina. Please see datasheet for further details. The recommended solders are Sn (62) / Pb (36) / Ag (2), Sn (96.5) / Ag (3.5), or standard Sn / Ag / Cu solder alloys. The CC2520FC low resistance precision flip-chip surface-mount resistor series from Caddock offers resistance values from as low as 0.01Ω up to 10Ω making it ideal for current sensing applications. The CC2520FC series features low inductance of 5nH (typical) which provides excellent high frequency and pulse response, with high pulse handling and overload capabilities. 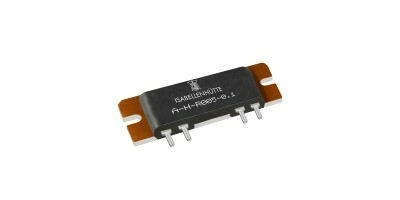 For general applications, the CC2520FC series has a power rating of 1.5W (at +70°C). The CC2520FC series from Caddock is the best choice for switching power supplies, motor speed controls and high current sensing applications. Thermal resistance is provided for the CC2520FC series to optimise high power designs when utilising higher thermal conductivity circuit board substrates such as IMS or Alumina. Please see datasheet for further details. The CC2520WB low resistance precision wire-bondable surface-mount resistor series from Caddock offers resistance values from as low as 0.025Ω up to 10Ω making it ideal for current sensing applications. The CC2520WB series features low inductance of 5nH (typical) which provides excellent high frequency and pulse response, with high pulse handling and overload capabilities. The WB variant of the CC series from Caddock is a hybrid mountable version with metallised pads for wire-bonding utilising aluminium wire and a metallised back surface for solder attachment of the back surface to a heat sinking substrate. The CC2520WB series from Caddock is the best choice for switching power supplies, motor speed controls and high current sensing applications. Thermal resistance is provided for the CC2520WB series to optimise high power designs when utilising higher thermal conductivity circuit board substrates such as IMS or Alumina. Please see datasheet for further details. The CD2015FC low resistance precision flip-chip surface-mount resistor series from Caddock offers resistance values from as low as 0.01Ω up to 0.2Ω making it ideal for current sensing applications. 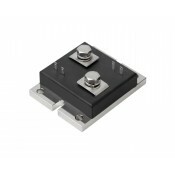 The CD2015FC series features a unique pedestal terminal design for surface-mount applications as well as low inductance of 5nH (typical) which provides excellent high frequency and pulse response, with high pulse handling and overload capabilities. For general applications, the CD2015FC series has a power rating of 1W (at +70°C). Thermal resistance is provided for the CD2015FC series to optimise high power designs when utilising higher thermal conductivity circuit board substrates such as IMS or Alumina. Please see datasheet for further details. 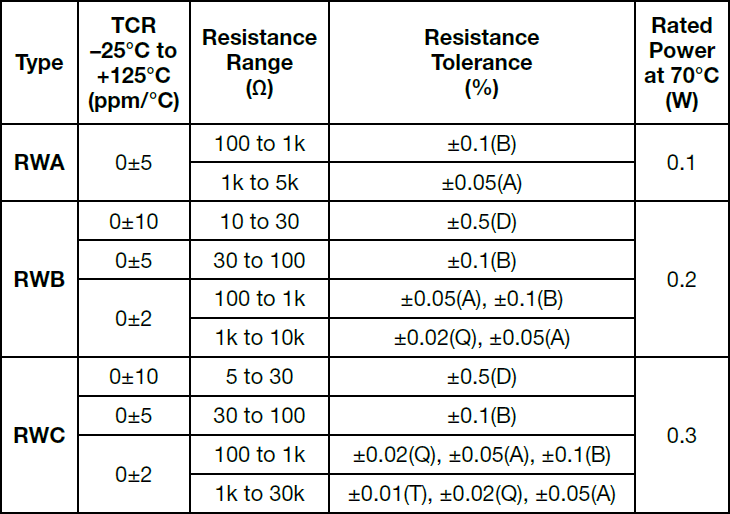 Please note that during soldering of all CD resistors from Caddock, the soldering temperature profile must not cause the pedestal terminals of this device to exceed +220°C. The recommended solders for flip-chip solder attachment are Sn (62) / Pb (36) / Ag (2). The CD2015WBA low resistance precision wire-bondable surface-mount resistor series from Caddock offers resistance values from as low as 0.01Ω up to 0.2Ω making it ideal for current sensing applications. The CD2015WBA series features a unique pedestal terminal design for surface-mount applications as well as low inductance of 5nH (typical) which provides excellent high frequency and pulse response, with high pulse handling and overload capabilities. The WBA variant of the CD series from Caddock is a hybrid mountable version with copper pedestal terminals and an aluminium surface layer for wire-bonding utilising aluminium wire and a metallised back surface for solder attachment of the back surface to a heat sinking substrate. Thermal resistance is provided for the CD2015WBA series to optimise high power designs when utilising higher thermal conductivity circuit board substrates such as IMS or Alumina. Please see datasheet for further details.